Honda’s smallest sedan, the Honda Amaze, has been given a complete makeover. It has entered its second generation and has gone on sale at a starting price of INR 5.60 lakhs (ex-showroom). Honda invited us to drive the compact sedan in Bengaluru. Here’s our take on the new 2018 Honda Amaze. The 2018 Honda Amaze sports a very appealing design. Underpinned by an all-new platform, the second-gen Honda Amaze is 5 mm longer, 15 mm wider and 5 mm lower than its predecessor. It measures 3,995 mm in length, 1,695 mm in width and 1,500 mm in height. Honda has generously stretched the wheelbase by 65 mm to 2,470 mm. The wheel size is up from 14-inches to 15-inches. The redesigned model offers 5 mm more ground clearance (170 mm). Considering just the exterior, the second generation Honda Amaze is as good as a sub-4 metre sedan gets in terms of the way it looks. Thanks to a revolutionary design, it has no traces of its predecessor and sheds the appearance of a 'hatchback with a boot'. Honda has borrowed design cues from its latest iterations of bigger sedans like the tenth-gen Honda Accord and the Honda City for this model. The 2018 Honda Amaze has Honda’s signature Solid Wing Face with unified upper grille and headlights. The slim headlamps’ positioning is somewhat reminiscent of the BMW i8. The thick chrome grille floats above these headlamps. The profile of a sub-4 metre perhaps has the highest impact on its overall character. There’s limited length to play with, but still, Honda has excelled at it in case of the latest Honda Amaze. This is where it becomes evident that the sedan was designed from the scratch and is not a follow-up to a hatchback. A strong character line runs along the length of the car starting from the headlamps all the way back to the tail lamps. Up top, there’s a dash of premium styling with a Shark-fin antenna at the back. The longer hood, pushed-back A-pillar, traditional beltline and well-proportioned greenhouse make the all-new model look like a proper sedan. 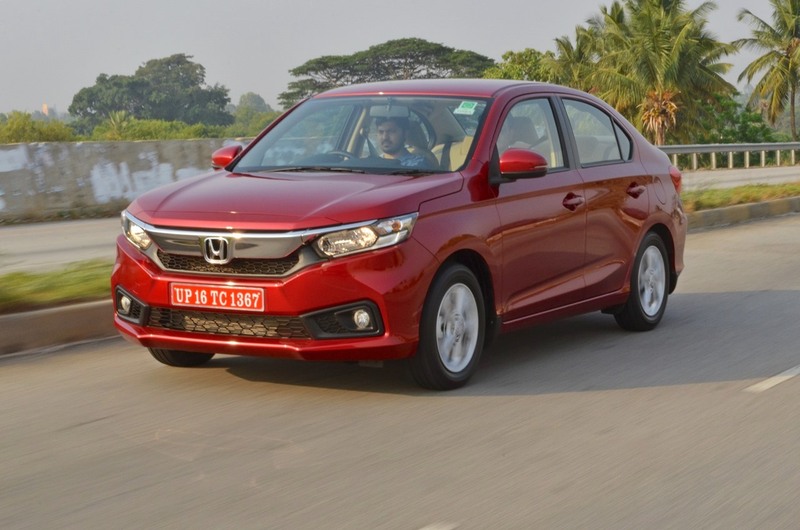 The 2018 Honda Amaze does not look like a typical sub-4 metre sedan because of its well-balanced proportions. The rear-end of the 2018 Honda Amaze, surprisingly for a sedan its size, looks quite sporty. The dynamic look here is achieved by a subtle decklid spoiler, C-shaped tail lamps and sharply designed license plate recess and creases on the bumper. Do note that the extended portion of the tail lamps on the tailgate is non-functional. Inside, the sub-4 metre sedan is more spacious now. The rear head clearance (sides) and shoulder room have improved up by 10 mm and 45 mm respectively. The boot space is up by 20 litres to 420 litres and is the highest in the segment now. Getting to the aesthetics, only a few aspects, such as the beige-black colour scheme, the USB port cap’s design, are reminiscent of the old model. The dashboard, centre console, instrument panel, steering wheel, air vents and almost every other element have a new, much more appealing design. Gloss black inlays give a nice touch to the pleasant colour scheme. However, bits like the gearshift knob and the gearshift gaiter look a tad flimsy. The 2018 Honda Amaze is available in four mechanical configurations. There are two engines options - the 1.2L i-VTEC petrol and 1.5L i-DTEC diesel. As before, a 5-speed manual transmission is standard, but the CVT option is now available with the diesel engine as well - a first for a Honda globally. No other car is currently available in a diesel-CVT combination in the Indian market. The 1.2L i-VTEC petrol engine tends to get quite noisy at engine speeds beyond 2,500 rpm. The 2017 Honda Amaze’s 1.2L i-VTEC petrol engine produces 88 PS at 6,000 rpm and 109 Nm of torque at 4,500 rpm. The 2018 Honda Amaze’s 1.2L i-VTEC petrol engine is tuned to deliver 90 PS at 6,000 rpm and 110 Nm of torque at 4,800 rpm. 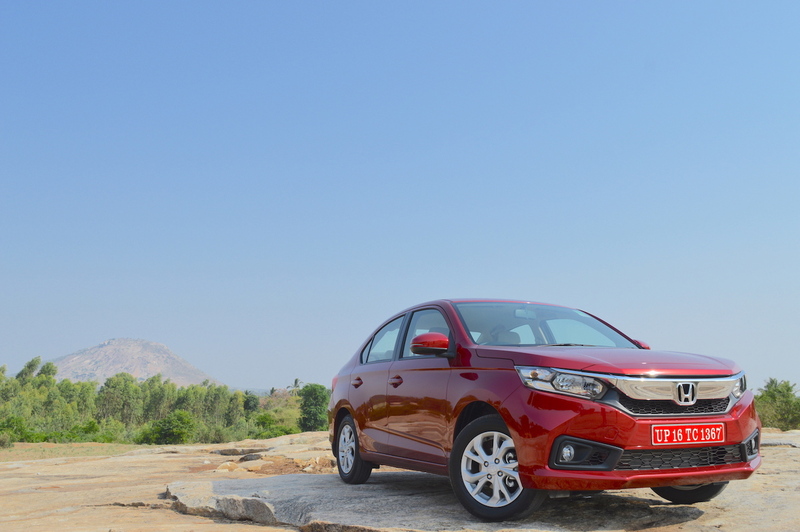 The updated petrol engine offers a delightful city drive but lacks the punch on the highways. Revving the engine beyond 2,500 rpm makes it noticeably louder, especially at higher speeds on the highways. There are paddle shifters present (a segment first), but if fun-to-drive is something you’re looking for, then the diesel might be the right option for you. The 5-speed manual transmission is light and offers easy gearshifts, and is the ideal choice for those concerned with the car’s fuel economy. The CVT offers a decent drive, but sudden acceleration at low speeds highlights the inherent rubberband effect. However, customers opting CVT will be pleased with its performance in urban conditions and a relaxed highway cruising. So, this shouldn’t create much of an issue. The 2018 Honda Amaze is Honda's first car available in a diesel-CVT configuration globally. The 1.5L i-DTEC diesel engine remains unchanged in the manual transmission model, delivering 100 PS at 3,600 rpm and 200 Nm of torque at 1,750 rpm. 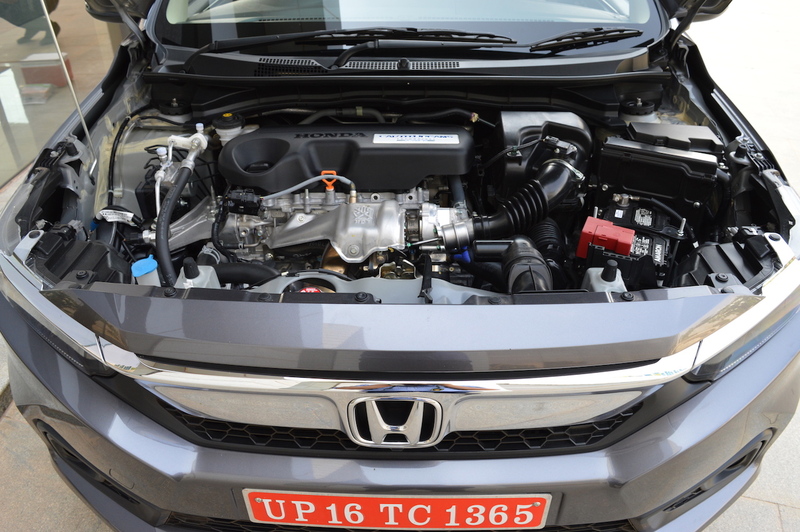 For the CVT model, though, Honda has detuned this engine as CVTs don’t go that well with very a high amount of torque. The maximum power and maximum torque figures are 80 PS and 160 Nm respectively, available at 3,600 rpm and 1,750 rpm respectively. Honda has paid attention to lowering the NVH levels and it shows. The noise from the diesel engine filtering into the cabin remains in check. One of the reasons behind this is that unlike the petrol engine model, the diesel engine model features a bonnet insulation pad. The diesel engine model does have some vibrations, but not enough to put you off. The diesel-MT configuration offers the best performance of the four. The typical downside of diesel engines lacking responsiveness at low engine speeds is close to non-existent. The 1.5L i-DTEC motor loves being pushed hard and is very responsive at high speeds. Reaching triple-digit speeds doesn’t require much effort and is much quicker than in the petrol configurations. 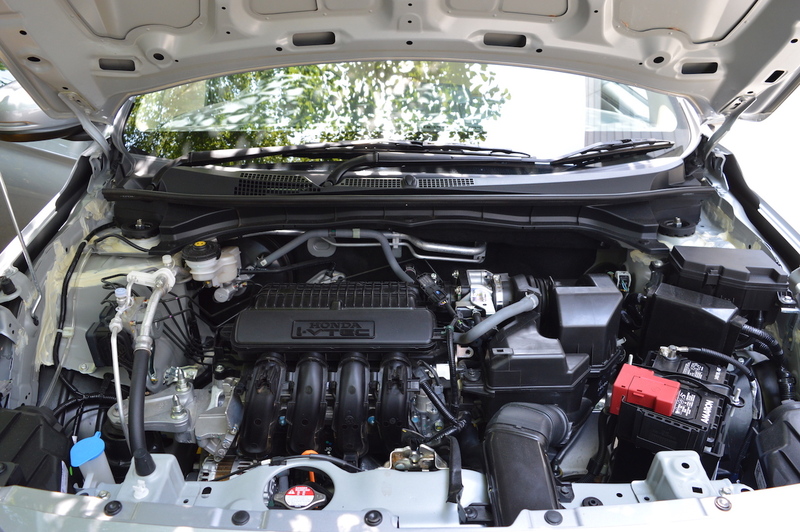 The diesel engine in the CVT model, although 20% low on power and torque, is not disappointing. The diesel-CVT configuration offers a much more composed drive than the petrol-CVT configuration. It doesn’t let down even when revved hard, although that’s not to say it is sprightly. Paddle shifters are not available here, but you won’t feel the need for it as the CVT manages to carry its task fairly well in all conditions. To get more power when climbing, and for maximum engine braking when going down steep hills, a Low transmission mode available is available. 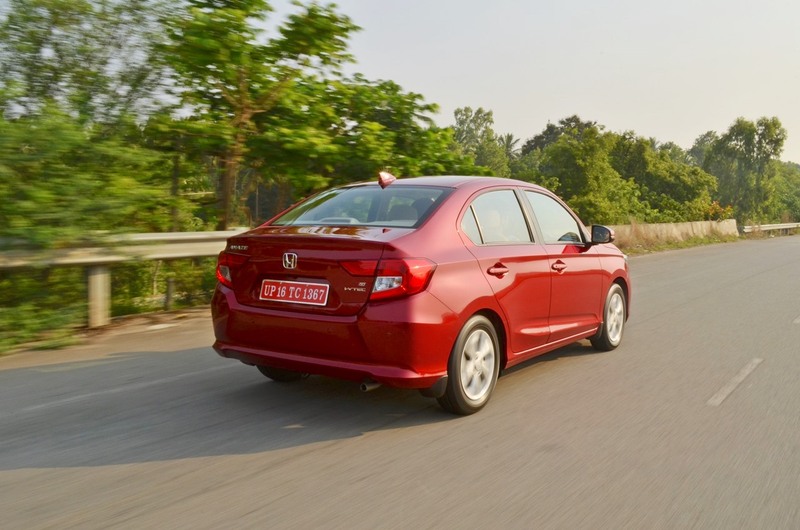 The new generation Honda Amaze impresses in terms of ride quality and handling. The car has a very good suspension setup to tackle bumps, potholes and unpaved roads. It is just stiff enough for highway drives too. Despite the soft suspension setup, the car’s stability at high speeds is quite praiseworthy. 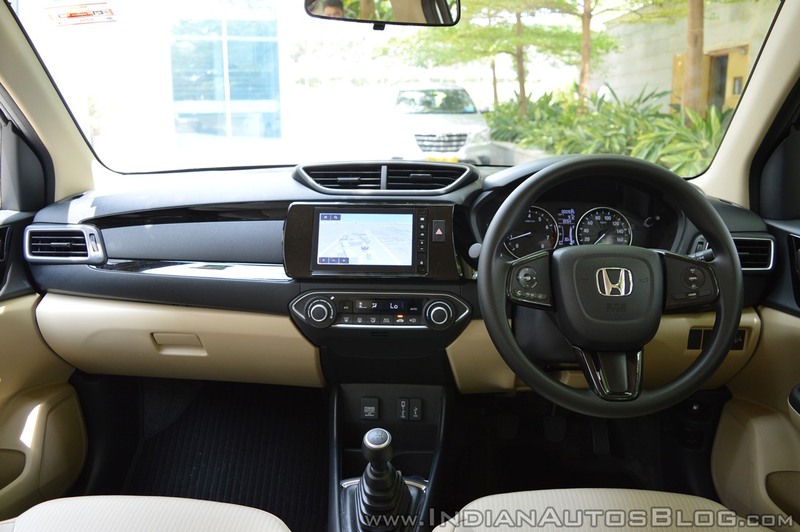 The 2018 Honda Amaze is well-mannered at high speeds and a pleasure to drive in the diesel-MT configuration. Honda has managed to balance the steering rather well as it is neither to light nor too heavy. Some drivers may prefer a very light steering for their daily commute in the cities, but the confidence this setup offers on highways is absolutely worth that little more effort required in urban driving. The second-gen Honda Amaze is 17 kg (petrol)/23 kg (diesel) lighter than its predecessor. With the weight reduction and other improvements, Honda has managed to increase the fuel economy across the range. The petrol-MT configuration’s fuel economy is up by 1.7 km/l to 19.0 km/l. The petrol-CVT configuration’s fuel economy is up by 0.9 km/l to 18.1 km/l. The diesel-MT configuration now delivers 27.4 km/l, marking a rise of 1.6 km/l. The new diesel-CVT configuration has a fuel economy rating of 23.8 km/l. As mentioned before, the 2018 Honda Amaze is bigger and more spacious than its predecessor. The redesigned model offers comfortable seating for the front and rear-seat occupants. There’s decent legroom in the front and rear both. The front-seat headrests have a sporty design. The headroom in the rear is average. Tall passengers may find their head touching the roof sometimes. The space in the rear is adequate for two adults and a child. Three full-sized adults will fit, but things might get slightly uncomfortable over long journeys. 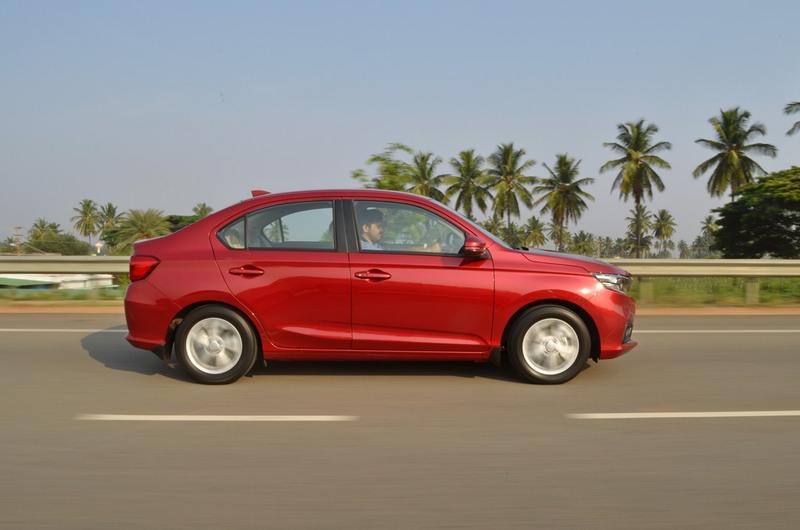 The second-gen Honda Amaze is more spacious than its predecessor and offers a number of new technologies. Like the previous generation model, the new generation model misses out on rear AC vents. It is strange to see that Honda was thoughtful enough to add a power outlet for the rear-seat passengers, but not AC vents. The company claims that the AC has improved, though, thanks to a larger compressor. Cruise control has made it to the sub-4 metre sedan with the first lifecycle makeover, but not in the petrol-CVT and diesel-CVT configurations as they are not offered in the range-topping VX grade. The new MID does not have a gearshift indicator. Unlike the old model, the all-new Honda Amaze features passive keyless entry and an engine start-stop button, which level up convenience. The engine start-stop button glows white when the doors are unlocked, as a welcome gesture, and turns red when the engine starts. The Digipad 2.0 touchscreen infotainment system offers satellite navigation and Apple CarPlay, Android Auto and MirrorLink support. Like cruise control, it is unavailable in the petrol-CVT and diesel-CVT configurations. The quality of the 4-speaker sound system is satisfactory. In addition to the standard 1.0A USB port, a 1.5A USB port is included in the redesigned model. The 2018 Honda Amaze is equipped with safety features as standard - ABS with EBD, dual-front airbags and ISOFIX child-seat tethers. ISOFIX is a new addition, while ABS with EBD and dual-airbags were not standard in the old model. Rear parking sensors and rear parking camera are also available now. In the first-gen model, rear parking sensors were available as an optional accessory, but rear parking camera was unavailable. The company offers 3 years/unlimited km warranty as standard. 4 year/unlimited km and 5 year/unlimited km extended warranty packages are available. The company offers an annual maintenance package for a price of INR 3,500/year for the petrol engine model and INR 4,900/year for the diesel engine model. The standard warranty covers the 2018 Honda Amaze for 3 years/unlimited km. Overall, the 2018 Honda Amaze comes across as one of the best sub-4 metre sedans on offer right now. Honda has managed to get the pricing right posing a serious challenge for the Maruti Dzire. The redesigned model has a striking appearance, an industry-first diesel-CVT configuration, good driving dynamics and comfort, decent fuel economy and almost all the features a customer would expect from a car at this price.